Mars' Valles Marineris canyons, where huge fault lines of rock (green) may have once been seeping with groundwater. Parts of ancientMars may have been wet for a billion years longer than scientists previouslythought, a new study of images of the red planet's surface suggests. Along withEarth and the other inner planets of our solar system, Mars formed about 4.5 billion years ago. Scientistshave long known that flowing water formed many of the features seen on Marstoday, but previous studies suggested that water runoff from precipitation hadceased after the first billion years of Mars' history, called the NoachianEpoch. But oneteam of scientists thinks these rains and floods persisted into more recent ?geologically speaking ? periods in Mars' history. 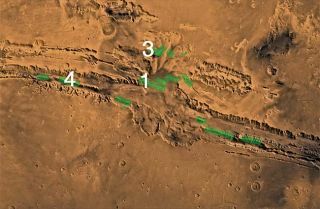 CatherineWeitz, a senior scientist with Planetary Science Institute in Tucson, Ariz., and her colleagues examined close-up images of the plains surrounding the huge VallesMarineris canyon system taken by the HiRISE instrument aboard NASA's MarsReconnaissance Orbiter (currently still circling the planet). HiRISE canresolve features as small as 3 feet (1 meter) in diameter. Weitz andher team noticed that light-toned layered deposits in the plains around VallesMarineris had different features from those inside the canyon; these featuressuggested that water continued to flow on a large scale in these plans afterthe Noachian, into the Hesperian epoch of Mars, until about 3.7 billion to 3billion years ago. Phenomena associated with flowing water are called fluvialprocesses. "Thiswas a big surprise because no one thought we'd be seeing these extensivefluvial systems in the plains all around Valles Marineris that were formedduring the Hesperian Era," Weitz said. "Everyone thought that by thenthe climate had pretty much dried out." Another recentstudy suggested that periods of rain and flooding on Mars were longer induration, not just short bursts, as had previously been thought. The depositsthat Weitz and her team observed outside the canyon showed "a lot ofvariations in brightness, color and erosional properties that we don't see forlight-toned deposits inside Valles Marineris," Weitz said. "Thissuggests that the processes that created the deposits outside Valles Marineriswere different from those operating inside." Twolocations near the canyon had inverted channels, which, on Earth, form whensediment deposits in a streambed over time. After the stream dries up, thesofter terrain surrounding the streambed erodes away, leaving the harder,cemented stream sediments forming a ridge above the surrounding terrain. Otherexplanations for the deposits, such as explosive volcanism and wind deposition,can't be ruled out, Weitz said, but the distinctiveness of the featuressuggests a fluvial origin, she added. "Whatwe're seeing tells us that this light-toned layering on the plains wasassociated with fluvial activity that wasn't occurring just in little pocketsover very brief episodes, but rather on a much larger scale for sustained timeperiods," she added. "For some reason, there was precipitation aroundValles Marineris that allowed these systems to form out on the plains." The detailsof the study are posted online in the journal Geophysical Research Letters.